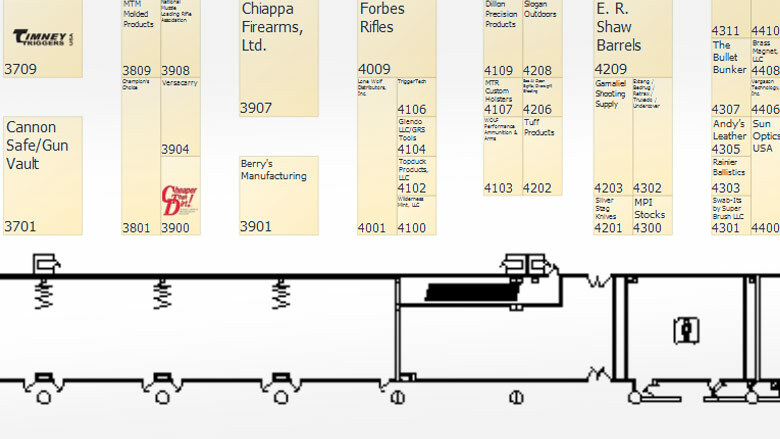 The Featured Product Center & Demo Area will be located in the lobby outside of Exhibit Hall D at the Kay Bailey Hutchison Convention Center. Below you will find a preview of the items that will be on display in this must-see area! Check back often, as updates to this page will be frequent. A special Featured Product Center Directory will be available for you to pick up as a reference guide to take home and share with friends. Make sure you check out the NEW Product Demo area, where companies referenced below will be conducting special product demonstrations, giveaways and more! The MantisX is a revolutionary firearms training system that helps you rapidly improve. A powerful rail-mount sensor analyzes every shooter movement and provides real-time feedback on how to improve. The Cellphone Pistol offers a great option for self-defense along with max concealment. The shape will not print as a pistol, yet can be drawn and fired quickly. Seven exciting new camouflage colors to customize your rifle's look. Ergo Elite series of Camo Collection consists of camouflage over molded AR Grips, M-LOK & Picatinny rail covers & Magwell grips. Ammo Armor is designed to protect your magazines from dirt, damage and debris. Made in the USA, these covers are inexpensive insurance to make sure your pistol goes bang. The SVS 1-6x optic is a true 1x optic with a 34mm tube, SFP 2MOA daylight visible red dot, MIL scale reticle, and capped zeroing knobs for both windage and elevation with 2/10 MIL adjustments. MC-10 is a high performance synthetic firearm lubricant that will not freeze, burn or carbonize. The included cleaner removes MC-10 lubricant along with carbon and fouling. A new line of 12 GA., inertia-based semi-auto shotguns offering premium quality components and construction, good looks and advanced features like chrome coated and ported barrels. A revolutionary drop-in recoiling dry fire trainer for your pistol. The new A-1 Triangle Hand Guard, made of 30% glass filled nylon, fits all 20" barrels with triangle hand guard cap. Made in the USA. Chelan shooting glass kits include a neoprene range bag, tough nylon frame with 3 sets of permanent anti-fog lenses (amber, clear and smoked), and a cleaning cloth. The Full Conceal M3D Pistol gives you more comfort and concealment, with a safer carry mechanism (compared to other pistols), and packs 22 Rnds (9mm) of firepower in a footprint of a common cell-phone. The M3S Pistol gives you more comfort and concealment, with a safer carry mechanism (compared to other pistols), and packs 13 Rnds (9mm) of firepower in a footprint of a common cell-phone. The SnagMag is a custom magazine holster concealed in plain sight. Designed to look like a knife riding in your support-side pocket, your magazine is comfortable and accessible for a FAST reload. The ATI GSG-MP40P Stock Kit is a must have accessory for anyone who wants to SBR their 9mm GSG-MP40P Pistol. This ATI 9mm Adapter will fit any standard AR-15 556/223 lower and convert to 9mm with no required modifications to lower or mags. It has a mag release for Glock mags and locks the bolt back after the last round. Pump less and shoot more with the pre-charged Nova Freedom Air Rifle. Features a high efficiency gas chamber that allows the user to fire up to 17 shots at 900 fps or greater after only 40 pumps of the handle! Life is unpredictable. With its cutting-edge design, this innovative holster shifts effortlessly into a variety of unique carry positions to face whatever life throws at you. Proudly made in the USA. The Howa Bravo blends traditional stock and chassis system. Full length aluminum centering section for rigid precision bedding surface and ergonomic adjustments. Experience the power that effective illumination can provide. Introducing Crimson Trace Tactical Lights, a best in class family of lighting products backed by the reputation you trust. Experience the power that increased illumination can provide to your defensive firearm. Introducing the CMR-208 Rail Master®; a best in class tactical light from the brand that you trust. The AlphaWolf Pistol Caliber Carbine (PCC) from Lone Wolf is a purpose designed platform targeting accuracy, strength and reliability. Glock magazine compatible and chambered for the 45ACP and 9mm. A new player in the world of home defense, the CD Defense Honcho Pump has a 14" barrel with blade front sight. Comes in 12GA, 20GA or spring-assisted .410 Bore. Includes ambidextrous sling attachment. The AirForce Texan, still America's Most Powerful Production Air Rifle. Legal for hunting deer in Texas starting November 2018. Stop by and see the whole Texan Family for yourself! NEW - M&P380 SHIELD EZ pistol has an easy to load 8 round magazine with load assist button, easy to rack slide, M2.0 crisp trigger and enhanced grip texture. Perfect for personal and home protection. 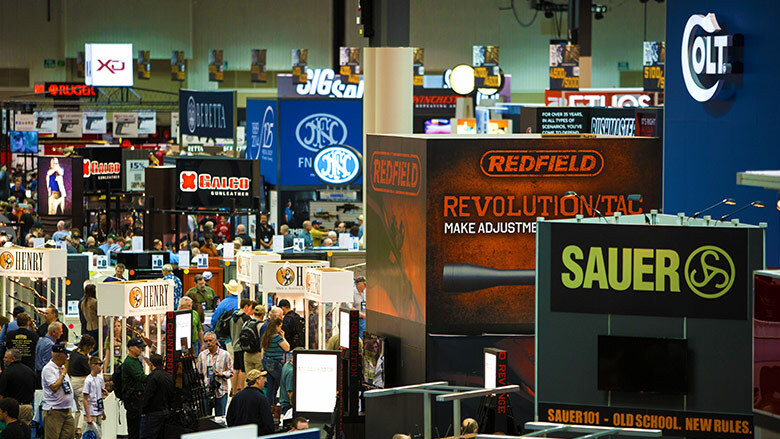 Visit the Featured Product Center & the Trijicon Booth for the exclusive reveal of two brand new products! The comfortable Hip Hugger Classic Holster holds 4 firearms and 3 magazines. Washable & made in the USA with Holster Tabs, magnets and non-slip grip. A size for every woman and a style for every gun! The T1000 is a rugged target hit indicator with a weatherproof enclosure and extended battery life. Its flexible rubber reflector is designed to withstand many impacts before needing to be replaced. STREAK’s exclusive patented technology allows the shooter to visually see the projectile's path towards its target. STREAK rounds are non-incendiary and don't generate heat. Rex Alpha - 9mm, 17-round, 5.0” barrel, 9x19mm, steel frame competition pistol. Hammer fired, DA/SA or SAO Mode, Ambi safety & mag release, Fiber Optic Front and Adjustable Rear Sights. Center-Lok Overhead Gunrack for Full Sized Crew Cab Pickup Truck. #CL1500 Fits Overhead without drilling Holds 2 rifles in truck (1 gun and tactical version available as well. Conquest V4 are for hunters and shooters whose lifestyle and adventures involve traditional and long-range hunting, as well as shooting and long-range shooting: 1-4x24 / 3-12x56 / 4-16x44 / 6-24x50. Bluetooth connected laser rangefinder (16-2500 yds) with ballistic calculator to ensure precise shots from any distance and angle, using real-time weather and location data: 8x42 / 10x42 / 8x54 /10x54. Gun Pro LLC presents the first magazine specifically designed to eliminate feed jams. Patented technology removes the most common source of firearm failures. Gun Pro's Delta 1 Sights are a revolutionary, patented, single-point targeting system. Fast, intuitive and accurate. Take your shooting to the next level with Gun Pro. 3 Water-Resistant Pockets • True Sizes 28-44 • Ambidextrous • Lingerie Lace Over Sturdy Corset Elastic With Lingerie Hook & Eye closures. The Christensen Arms Modern Precision Rifle is the next-generation chassis system. Developed with a 100% proprietary chassis and weighing less than 7lbs (16” .308), it's ready for your next adventure. The Elite’s clip point blade engages with the push of a button and features an upgraded steel S30V. This handle bypasses the classic 110 look with black G10 and nickel silver bolsters. Our new multi-patented "AMERICAN PUREBRED" holster by MASSARO HOLSTER WORKS will change the concealed carry holster market forever by making many current IWB concealed carry holster designs obsolete. Performance Center products are the ultimate expression of old-world craftsmanship blended with modern technology. Stop by the Smith & Wesson booth and check out the new PC M686 Vented Rib Barrel firearms. 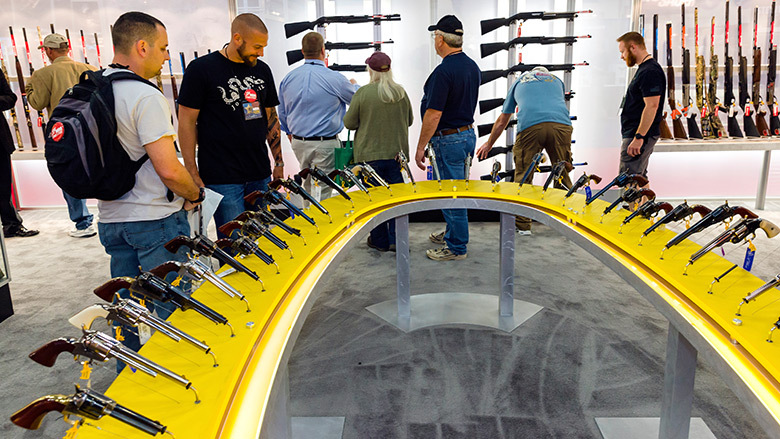 Visit the Featured Product Center & the Smith & Wesson Booth for the exclusive reveal of a brand new product! Guaranteed Rocky waterproof construction – oil and slip resistant, non-marking rigiTrac molded EVA/rubber outsole – full-grain water resistant leather. Flash and water resistant leather – wicking Dri-Lex lining and stretch Lycra tongue hug feet for secure fit – Aegis Microbe Shield applied to Rocky Air-Port cushion footbed – 1,000 Denier Cordura and Triple stitched construction.